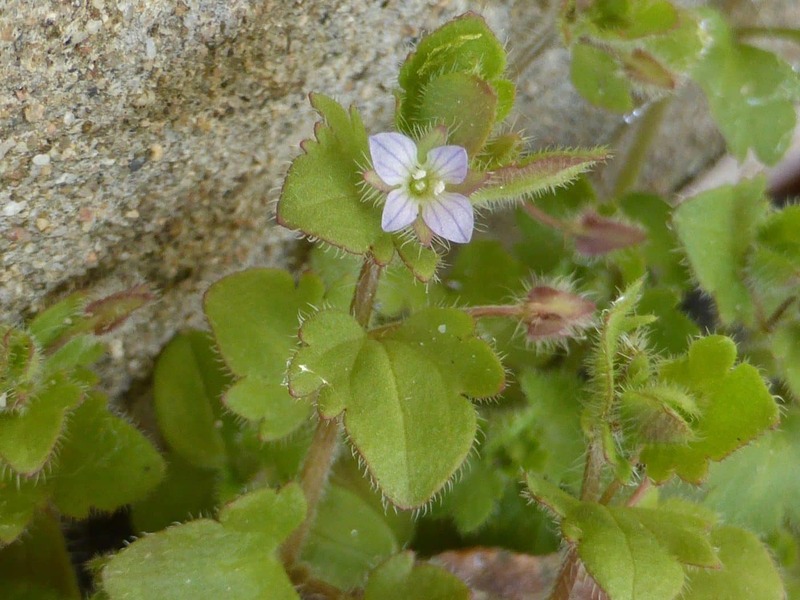 The speedwells Veronica spp. are one of the larger genera in the British flora, with over 20 native species, of which some 11 have been found in Assynt. Three are widespread here in grassland and heathland, germander speedwell V. chamaedrys, with large bright blue flowers, and the less showy heath and thyme-leaved speedwells V. officinalis and V. serpyllifolia. The other eight species are mainly plants of cultivated or marshy ground, although one, slender speedwell V. filiformis, is found in lawns; it is a relatively recent addition to the Assynt flora, first noted at Lochinver in 1957. Those found in cultivated land have declined in abundance as this has disappeared from our landscape. The most extreme case is that of ivy-leaved speedwell V. hederifolia, which was first recorded at Elphin in 1886 and not seen again for 130 years. In May 2016 Gwen found a small amount in a stony corner of her garden at Torbreck (NC0824) and this April it appeared again in the same spot. It is an annual, with solitary whitish to pale-blue flowers in leaf axils, calyx lobes that are heart-shaped at their bases and leaves with a conspicuous apical lobe, like those of ivy. It has always been very sparsely distributed in the west and north of Scotland and this is only the second record north of Inverness of the particular sub-species, V. hederifolia hederifolia. It may have originated in soil associated with plants imported into her garden from further south, but is, nevertheless, well worth recording. This is, after all, how our local and national floras have been augmented, over several millennia, with species from all over the world.